Started a business? Yay! Using all the corporate images and branding? Boo! 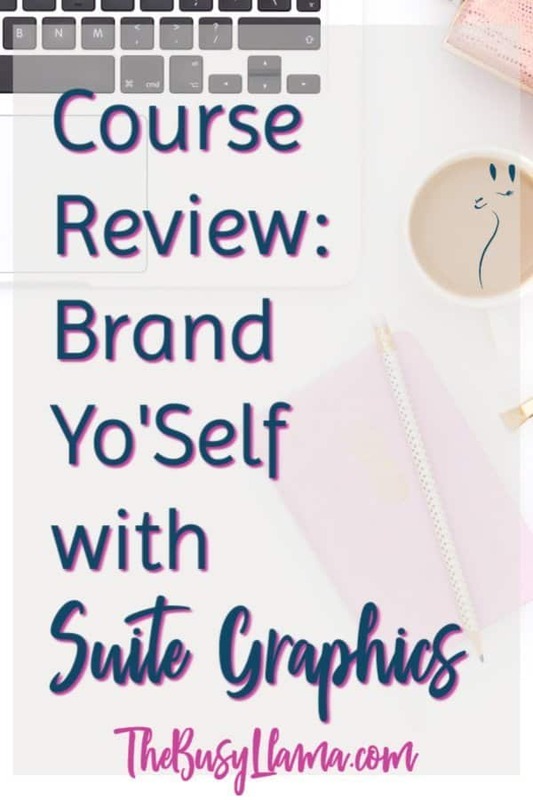 Learn how to make your mark on the world with personal branding with Brand Yo’Self with Suite Graphics. The courseis designed with the novice graphic designer in mind. It is an overview of why branding is important, some various tools and tips, and ends with an overview of building your own branding board. It hits all the highlights to help you brand yourself if you aren’t quite sure how to start. It is a great introduction to graphic design and taking some improved photos. As I can attest, when you first start making your own graphics it can be challenging. Especially trying to create a cohesive voice, which is important as I discuss in this post. The course lays it out pretty simply. The course has also been recently updated, which is refreshing since a lot of times video courses are not or you do not have access to the updates if they are completed. The tail end of the course feels a bit overly “salesy.” The pitch is coming from a place of service but the tool they are pitching can actually be done on your own at no cost. Curious how? Check out this post. As previously stated, the course is great for someone with limited or no graphic design experience. If you are already familiar with graphic design tools and tips but don’t have your branding board in created you can pick up some tips for setting one up. Still struggling to figure out what you want your business to be? Then be sure to keep following along with our Do What You Love series by subscribing. Know what your passion is? Then I would love to give you a shout out and learn more about your business. Drop me a line and let’s chat. Also, be sure to check out my other branding-related posts, why you should brand yourself and tips for personal branding, so start off strong and kick some tush!